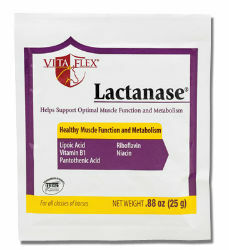 Supports healthy muscle function and metabolism in horses. It supplies nutrients important for the formation of acetyl coenzyme A, the key to efficient energy release from both carbohydrates and fats. This supports the animal to be shown at a higher potential with more flexibility and energy. One packet equals 25 grams. Blend thoroughly. During daily conditioning, top dress 2 packets for first two days, then 1/2 to 1 packet each day of conditioning or workout. For stress or performance, top dress 1 packet three hours prior to the event.